Want to be notified of new releases in sethm/symon? See the file COPYING for license. Symon is a general purpose simulator for systems based on the MOS Technologies 6502 microprocessor and compatibles. Symon is implemented in Java. Its core goals are accuracy, ease of development, clear documentation, and extensive test suites for validating correctness. Symon simulates a complete system with a 1 MHz NMOS 6502 or CMOS 65C02, 32KB of RAM, 16KB of ROM, a MOS 6551 or Motorola 6850 ACIA, a MOS 6522 VIA, and an experimental 6545 CRTC. Symon has extensive unit tests to verify correctness, and fully passes Klaus Dormann's 6502 Functional Test Suite as of version 0.8.2 (See this thread on the 6502.org Forums for more information about this functional test suite). Symon is under constant, active development. Feedback and patches are always welcome. 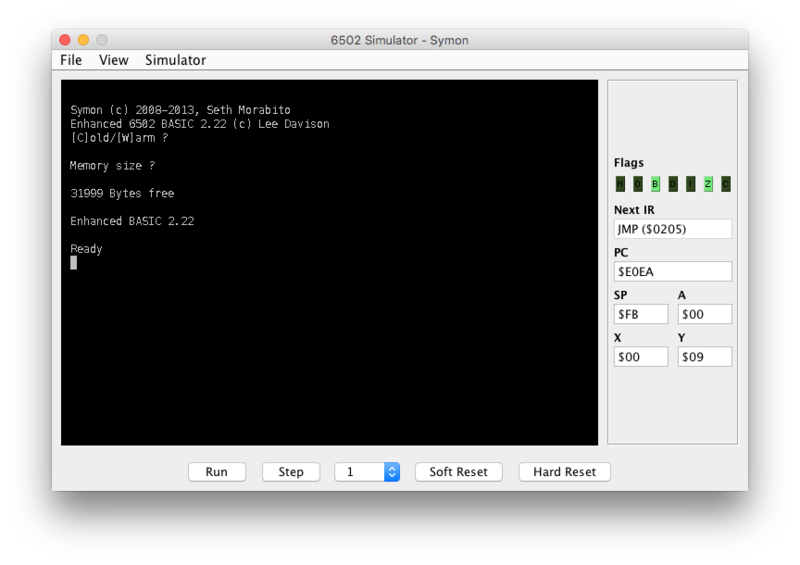 Symon can simulate multiple 6502 based architectures. At present, three machines are implemented: Symon (the default), MULTICOMP, and a "Simple" machine useful for debugging. The CRT Controller uses memory address $7000 as the start of Video memory. It also provides CPU status. 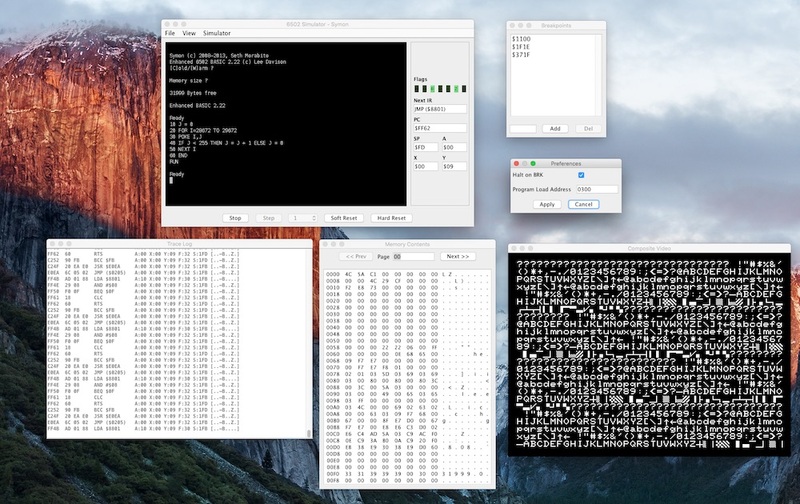 Contents of the accumulator, index registers, processor status flags, disassembly of the instruction register, and stack pointer are all displayed. 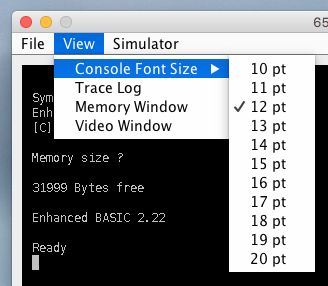 The console supports font sizes from 10 to 20 points. Symon can load any appropriately sized ROM image. The Symon architecture expects as 16KB (16384 byte) ROM image, while the MULTICOMP architecture expects an 8KB (8192 byte) ROM image. Images are loaded via the "Load ROM..." action in the "File" menu. The selected ROM file will be loaded into memory at the correct ROM base address. Memory contents can be viewed (and edited) one page at a time through the Memory Window. 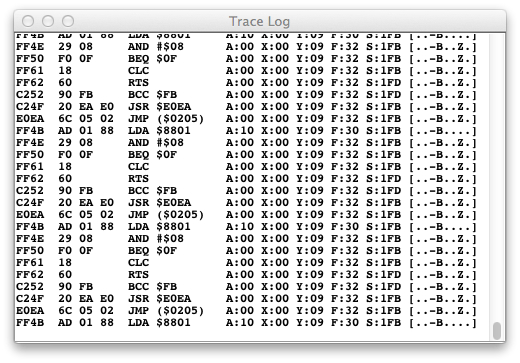 The last 20,000 execution steps are disassembled and logged to the Trace Log Window. Simulated speeds may be set from 1MHz to 8MHz. 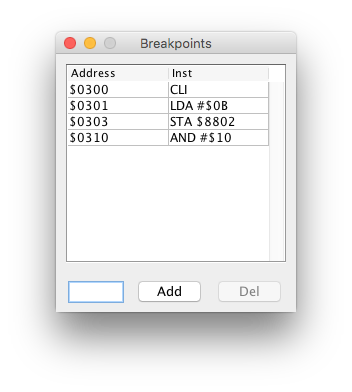 Breakpoints can be set and removed through the Breakpoints window. This feature is highly experimental. It's possible to open a video window from the "View" menu. This window simulates the output of a MOS 6545 CRT Controller located at address $9000 and $9001. By default, the 40 x 25 character display uses video memory located at base address $7000. This means that the memory from address $7000 (28672 decimal) to $73E8 (29672 decimal) is directly mapped to video. The simulated 6545 supports only the straight binary addressing mode of the real 6545, and not the Row/Column addressing mode. The simulated 6545 has full 16 bit addressing, where the real 6545 has only a 14-bit address bus. The simulation is done at a whole-frame level, meaning that lots of 6545 programming tricks that were achieved by updating the frame address during vertical and horizontal sync times are not achievable. There is no way (for example) to change the Display Start Address (R12 and R13) while a frame is being drawn. 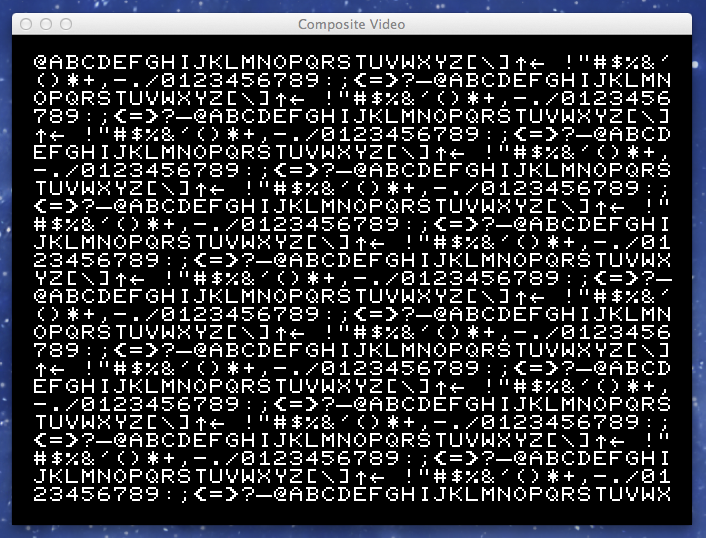 This program will fill the video screen with all printable characters. Maven will build Symon, run unit tests, and produce a jar file in the target directory containing the compiled simulator. When Symon is running, you should be presented with a simple graphical interface. The simulator requires a ROM image loaded into memory to work properly. Without a ROM in memory, the simulator will not be able to reset, since the reset vector for the 6502 is located in the ROM address space. By default, any file named rom.bin that exists in the same directory where Symon is launched will be loaded as a ROM image. ROM images can also be swapped out at run-time with the "Load ROM Image..." in the File menu. 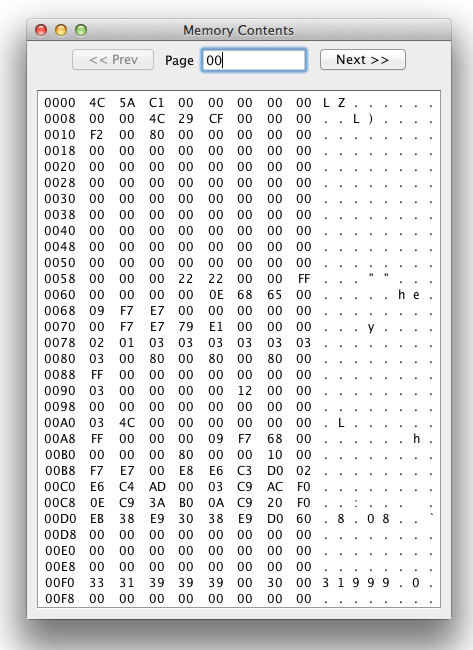 The "samples" directory contains a ROM image for the Symon architecture named 'ehbasic.rom', containing Lee Davison's Enhanced 6502 BASIC. This serves as a good starting point for exploration. Note: Presently, EhBASIC only works with the Symon machine architecture, not with MULTICOMP. In addition to ROM images, programs in the form of raw binary object files can be loaded directly into memory from "Load Program..." in the File menu. Programs are loaded starting at addres $0300. After loading the program, the simulated CPU's reset vector is loaded with the values $00, $03, and the CPU is reset. There are two very simple sample program in the "samples" directory, for testing. 'echo.prg' will echo back anything typed at the console. 'hello.prg' will continuously print "Hello, 6502 World!" to the console. 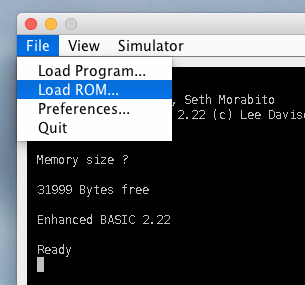 After loading a program or ROM image, clicking "Run" will start the simulator running. 1.3.0: 24 February, 2018 - Adds support for 65C02 opcodes. 1.2.1: 8 January, 2016 - Remove dependency on Java 8. Now supports compiling and running under Java 1.7. 1.2.0: 3 January, 2016 - Add symbolic disassembly to breakpoints window. 1.1.1: 2 January, 2016 - Minor enhancement: Allows breakpoints to be added with the Enter key. 1.1.0: 31 December, 2015 - Fixed delay loop to better simulate various clock speeds. Added ability to select clock speed at runtime. Status display now shows the next instruction to be executed, instead of the last instruction executed. Added support for breakpoints. 1.0.0: 10 August, 2014 - Added "Simple" machine implementation, pure RAM with no IO. Added Klaus Dormann's 6502 Functional Tests for further machine verification (these tests must be run in the "Simple" machine). 0.9.9.1: 27 July, 2014 - Pressing 'Control' while clicking 'Reset' now performs a memory clear. 0.9.1: 26 January, 2014 - Support for IRQ and NMI handling. 0.9.0: 29 December, 2013 - First pass at a 6545 CRTC simulation. 0.8.5: 30 March, 2013 - ASCII display for memory window. Allows user to select a step count from a drop-down box. 0.8.3: 12 January, 2013 - Added tool-tip text. Memory is no longer cleared when resetting. Fixed swapped register labels. 0.8.2: 01 January, 2013 - Fully passes Klaus Dormann's 6502 Functional Test suite! 0.5: 21 October, 2012 - Able to run Enhanced BASIC for the first time. 1.2: Better breakpoint support. Symbolic debugging of breakpoints. 2.0: Complete rewrite of the UI in JavaFX instead of Swing. Complete assembler and disassembler built in. Ability to attach source code for symbolic debugging. Feedback (in the form of dialogs, status bar, etc). Better debugging tools from the UI, including breakpoints and disassembly. UI needs a ton more polish. Implement CMOS 65C02 instructions and NMOS / CMOS mode flag. Allow displaying ACIA status and dumping ACIA buffers, for debugging. CRTC emulation is very naive. The whole frame is drawn in one CPU step. This should be improved by drawing scan lines during machine steps to approximate real NTSC/PAL refresh rates. Additional components used in this project are copyright their respective owners. Symon is free software. It is distributed under the MIT License. Please see the file 'COPYING' for full details of the license.